A mind-blowing ‘Visual’, don’t miss it!The film scores due to its intensity and the concept that has never been tried in Tollywood before. Overall, this is a film which will appeal to all genres of audience and has a super hit written all over it at the box office. Finally, Drishyam ends up as remake loyal to the original but could not derive the same respect due to narration glitches. A little more effort could have took it to a 'classic' range and now it ended up as just watchable film. Sripriya remade this hit Malayalam film and did not deviate from the original even in the costumes also. ?The film starts off slowly with the introduction of characters and as viewers think it as predictable storyline, director springs surprise in the climax. Though Sripriya fumbled in some places, overall she took care that thrill factor in the climax is not lost. Drushyam makes the audiences glued to the screens with its peak second half and impressive climax. Emotional Yet Thrilling!!! This is a family drama and thriller movie.As this is the remake of a Malayalam movie the story is near to the reality. We cannot expect normal comedy track and action in this movie. But the movie has maintained interest till end and Climax(ending) is good. This movie can be watched by the whole family together. The real highlight of course is the screenplay of the film. It keeps one hooked right till the end. Especially in the second half the way things unfold are surely going to excite anyone who hasn’t seen the original. From the moment the thriller angle in the family drama begins to the moment it finally ends, that is the highlight segment of the film. There is a slight bump during the climactic interrogation sequences but the final ending makes up for it. After a long time comes a thriller which is worth a watch and interesting till the climax. Drushyam is going to be his first such movie where a decent content-based film is made on a reasonable budget. This film is going to be a case study for Telugu film industry. We have seen many thrillers where the hero has dark shades. Drushyam is a thriller where hero is positive and he does it to save his innocent family. The main conflict point is very commercial one. But the narrative style (thriller orientation) is new to Telugu audiences. For the kind of budget it is made on, Drushyam is going to be a sure success. However, the range will depend on how it penetrates market. On a whole, Drushyam is a different and content-based family thriller. You may watch it! Drushyam is an amazingly well made movie with mature screenplay. Drushyam is definitely a trend setter. For all those who are in the thirst of watching a different movie, should never miss a masterpiece like Drushyam. It is a film for every father, mother, brother, sister and possibly all relations of this generation. Drushyam is a different and content-based family thriller. You may watch it ! Finally Satisfactory Attempt. A genre like Drishyam almost got extinct in Tollywood several years ago. People are more in to mass masala than gripping family dramas. It has to be seen how they receive this slow paced family entertainer now. If you love those films of 90s, you can give it a try! For Venky's fans out there, specially those who are grumbling over the actor's previous films, this film gives a fitting reply. Venky deserves laurels as it's not easy to accept a middle-aged role who has two daughters. On whole, Drushyam is a visual treat and lives up to its name. Director Jeethu Joseph since his debut with 'Detective' has managed to create a number of hit films including a 'Mummy and Me' which even entered Indian Panorama. And now with his first outing with Superstar Mohanlal, he has proved how mature he is as an inspiring director who surprise viewers with his storytelling methods. In this process he also delivers another hit for Mohanlal who had a bad time with his films in 2013. A gripping tale that keeps you engaged , the also have an impressive script, technical sides and performances to make it to the bests of the year from Mohanlal. On the whole, Drishyam is one film which works big time in all departments. Right from the striking performances of Venkatesh and Nadia, to the thrilling suspense elements, Drushyam has everything for everyone. A must watch for the entire family. An unconventional film, this film is refreshing as it is not formulaic. Above all, it is gripping and keeps you hooked throughout. 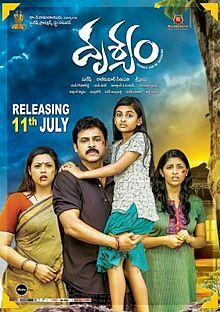 Drishyam is a fine suspense thriller with good emotions and fine performances from a capable star cast. Don’t miss this film. The narration appears simple, but the back ground music and the camera work make the scene bigger than actually it is. There are many scenes in the film that are nail biting. Especially the climax will not let you sit comfortably on the seat, as you would move to the edge of the seat. Nishikanth Kamat did not have much scope to show his directional skills, as he had, dropped the remake as it is. Drushyam has all elements in it. A must watch movie. Well done, producer Suresh Babu and hero Venkatesh Babu for experimenting with a right non-commercial subject. On a final note, a good first half could have raised my rating bar but for now below rating is definitely worth for. enkatesh should be patted on his back for doing roles which suits his personality and age. Drushyam requires lot of emotions, family drama and Venky is apt for this role. Probably he may be the sole reason to watch Drushyam.